VIDEO: Alex Levy on Canada AM - "MyVoice is Changing People's Lives"
CEO Alex Levy was back on CTV’s Canada AM program last Thursday, sharing some of MyVoice’s most inspirational user stories. Now used by more than 10,000 people with speech and language disabilities, many users have come back to us with the most extraordinary and heartwarming anecdotes of how MyVoice changed their lives. Lately we’ve been working with the wonderful team at Holland Bloorview Kids’ Rehab and had the honour of meeting a young man who has cerebral palsy. When we showed him MyVoice on the iPad he caught on instantly. In minutes, he was ordering his mom a coffee at the hospital cafe. The possibilities for independence that MyVoice can provide made us so proud. Sometimes these shining moments come over the phone. We recently heard from a mother who told us that our app allowed her child to tell her that he loves her, out loud, for the very first time in his life. It’s very easy to take those little things for granted, but for some people these simple gestures can mean the world. Although we have users in 30 countries, a few weeks ago we had someone stop us in the hall at our office building to tell us his family’s story. After having a stroke his grandfather had been left unable to speak. He was able to use MyVoice to communicate with his loved ones, something that otherwise wouldn’t have been possible. Earlier today, I had the great honour of being named Entrepreneur of the Year by PROFIT Magazine, as part of their 1st annual FuEL Awards for young business leaders. This award is a tremendous distinction, and I am deeply moved that the judging team at PROFIT chose me and MyVoice from a field of such brilliant leaders and companies. PROFIT’s celebration of MyVoice means so much, and will serve to help our efforts in so many ways: It shines a light on the work MyVoice is doing to give a voice to millions of people with speech and language challenges. It helps focus much-needed attention on our thousands of users, who struggle not just for speech, but also for social recognition and support. Most of all, it says that the MyVoice community is truly building momentum towards our dream of perfecting the world’s best communication aid. A recent story on CityTV took reporter Peter Kim to the bank with MyVoice and his personal vocabulary. Peter also interviewed Bill and Bonni Scott who are our first users and the inspiration for MyVoice. Bill came to the U of T Computer Science department frustrated with existing speech aids. This chance encounter led to the development of our amazing technology. We all owe Bill a debt of gratitude for being proactive and demanding more. Roger Ebert also praised the GPS location awareness and relevant vocabulary during his second book signing event in Toronto. Alex, Aakash and Tony talk with Craig Evans from Autism Hangout. We had a great conversation with Craig about MyVoice and it’s uses for the autism community. The use of GPS and vocabulary tailored to the location of the user is a great aid for independent living and life skills development. Craig Evans is not only a gracious and engaging host but also an incredibly dedicated and knowledgeable advocate for the special needs community. Autism Hangout is dedicated to bringing timely, relevant news, resources and hope to those affected by autism. This past Wednesday, we had the chance to meet Roger Ebert as he signed our copies of “Life Itself”, his latest book. Mr. Ebert signed hundreds of copies at the event while answering a constant stream of fan’s questions about films and… life itself. Mr. Ebert’s wife Chaz lead the Q&A period based upon her knowledge of his opinions and personal history, his hand gestures and signs, as well as his use of a small notepad. Toward the end of the event, Chaz graciously gave us an opportunity to tell her more about MyVoice and demonstrate a MyVoice account we made full of Roger’s favourite films and comments. We hope that MyVoice can be of real value to them both. 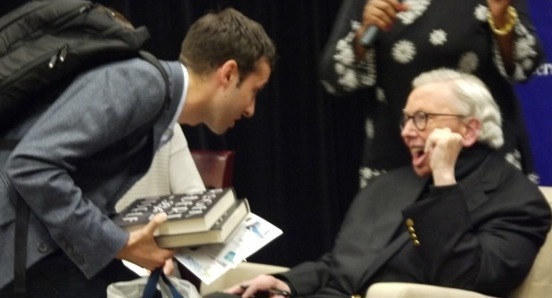 Maybe one day, we might even hear Mr. Ebert using it to chat at events just like this one! What an honour to have spent time with such an inspiring man who continues to thrive despite tremendous challenges.